If you can't decide on a Halloween costume to wear, perhaps you should let the almighty Claw decide. The Aliens let "Space Crane" decide their biggest life quandary: choosing who will get to go on to a "better place." Little do these squeaky aliens know the "better place" could mean being strapped to one of Sid's fireworks and blasted to the moon, but we find their eternal optimism refreshing. If you do too and you're also sick of stressing over what costume to wear, maybe you should put your trust in the divine Claw. Put all your favorite options inside the "Space Crane" and wait to see what it fishes out. We have a feeling that "the Master" will grab these Toy Story alien sunglasses since it's so accustomed to clutching little green men. 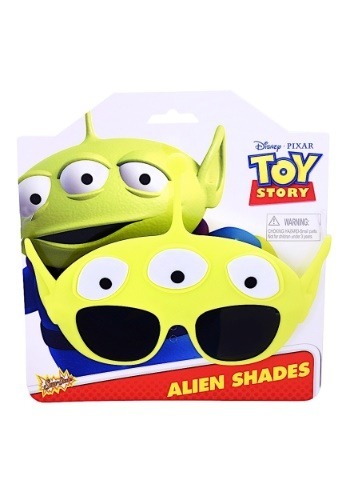 You'll say "ooh-aaah" once these officially licensed Toy Story sunglasses are plucked from the game. They feature shatter-resistant lenses with a smokey-mirror tint. They also offer 100% UV protection so they're ideal for wearing when the sun's out and they're ideal for wearing when it isn't. Use them to coordinate your unique costume! Costume possibilities are limitless once these glasses are in your possession. Wear them alone or pair them with a space suit to complete the look. With this one-of-a-kind costume, you'll be the "Chosen One" wherever you go.